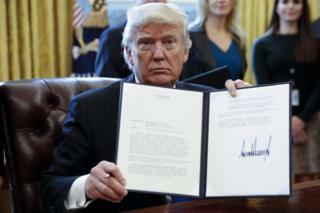 Orders range from dramatic reverses of policy, like Mr Trump's approval for the construction of two bitterly contested oil pipelines, to ordinary business, such as Mr Obama's instructions on half-day closing for government departments on Christmas Eve 2015. Authority for issuing the orders is rooted in Article II of the US constitution, which states: "The executive power shall be vested in a president of the United States of America." "If they're not going to do anything, we'll do what we can on our own," he told a crowd in Kansas City in July 2014. "That's when we act - when your Congress won't." An executive order has to work within the confines of the law, with, in theory, each one "reviewed by the Office of Legal Counsel for form and legality". This does not always happen. If an order is deemed to stray outside the boundaries of what is acceptable, it can be subject to a legal review. Congress can also pass a law to override the executive order, but a president still has a veto over that law, the Constitution Center explained. Roosevelt issued 3,721 orders during his 12 years in office, while Mr Obama signed just 279. George W Bush issued 291 over his eight years in power. Mr Obama's was a modest total by modern standards. His average of 35 orders per year is the lowest tally since Grover Cleveland, who was president from 1885-89, and then 1893-97 - and averaged 32 orders a year.